In case you missed the earlier Saturday post it is here. There are a couple of close up shots there. The secret quilt for my brother is finished and will be given to him at his surprise party. I also played with some machine embroidery. 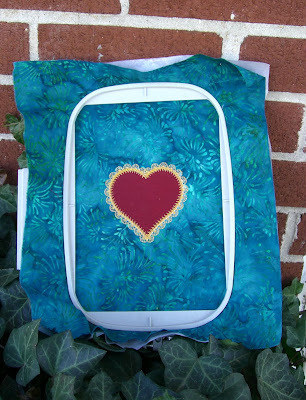 I got some files from Marjorie at http://shop.b-quilts.com/products. She also has a blog at http://b-quilts.com/blog/ She does some great work. If you like doing machine embroidery and have an Accuquilt GO! cutter, You can really find some treasures in her store. 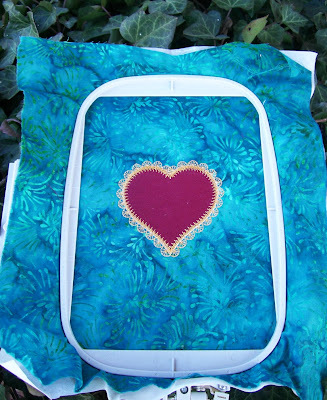 This is a Scalloped Heart from the Scalloped Hearts design set. I like this so much I took two pictures of the same heart - still in the hoop. I have some ideas, but for those I will have to use the extra large embroidery hoop. Stay tuned! Too cool. Love the embroidery heart,too. 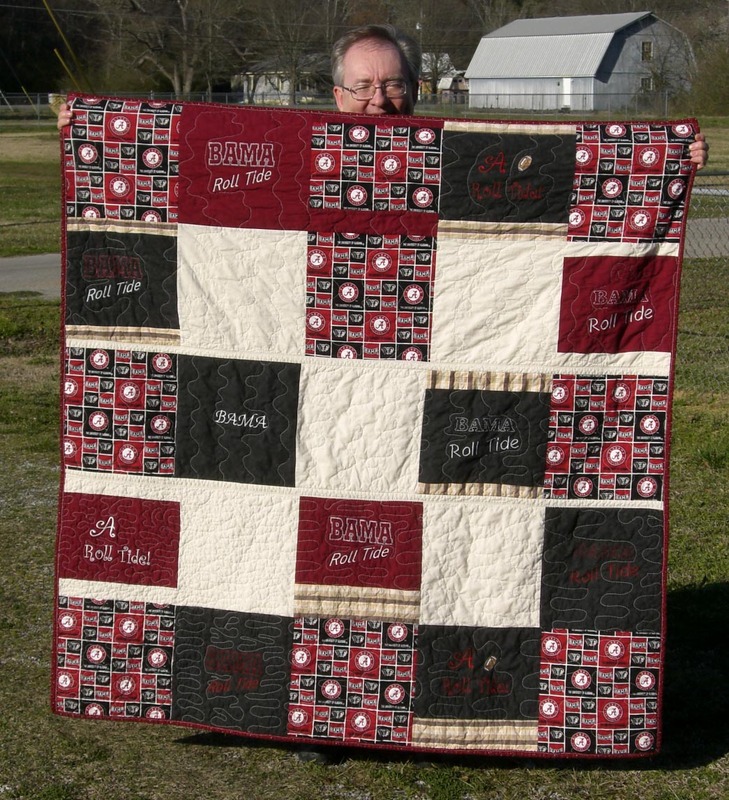 Love that quilt and the barn in the background. Looks like our neck of the woods,....add in a few mountains. You brother is going to be thrilled! Roll Tide! Gene, it's a wonderful quilt. Your brother is going to be so happy to have it. It's just perfect! Wow! that is beautiful! Glad you finished in time. WOW, it came out great!!! He's gonna love it!!! the quilt is going to be a great surprise gift! I think that has just got to be the best gift for your brother! Absolutely awesome! Awesome quilt! Your brother can't help but love it. Your brother's quilt looks fantastic. I'm sure your brother will love that quilt! Whoo hooo! Roll Tide! OK, now I got that out of my system. My first love is my school, tho, Go Tigers! 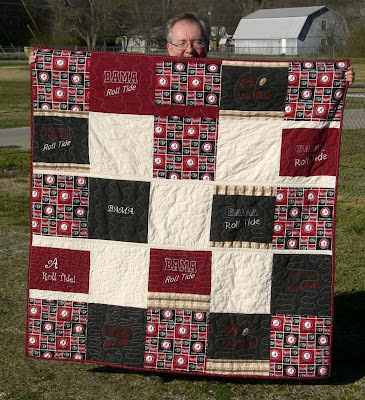 Love your quilt - bet he'll be so happy! What a wonderful quilt for your brother! Your embroidery is soooo beautiful!